Jenny Kingsley explores an artistic venture with a moral purpose. “An old lady stopped by and scolded my work, insisting there had never been any Gypsies in Cologne,” recalls Demnig. Appalled by her denial, the artist investigated the city's history to find proof that in the 1930s thousands of Gypsies and Jews had lived next door to the Germans in Cologne. Mr. Demnig then thought of the idea of Stolpersteine (“stumbling blocks”), commemorating individuals, which would be embedded in the streets where they had lived or worked. Indeed, if you come to think of it, all over the world, in public and sacrosanct places, there are memorials, be they statues, sculptures or plaques, commemorating people revered as exceptional because he or she has fought bravely in war and battle, enhanced our cultural heritage, exhibited military and statesmanlike leadership, remedied human rights abuse or discovered life changing phenomena. There are memorials in respect of animals that have aided people in battle; one famous one is dedicated to the animals that died alongside the British, Commonwealth and Allied forces in 20th century conflicts; it is located in Park Lane, London. There are statues memorialising literary characters such as Alice in Wonderland, Sherlock Holmes and Tintin. People, as a group, who have been the victims of appalling degradation, abuse and torture because of their race, religion, physical disability or mental illness, are memorialised. One fine example is the Nigerian born Sokari Douglas Camp’s All the World is Now Richer, a steel sculpture commemorating the abolition of slavery, which has been exhibited at St Paul’s Cathedral, Norfolk Cathedral, Bristol Cathedral and the House of Commons. The Holocaust memorials cannot fail to come to mind. 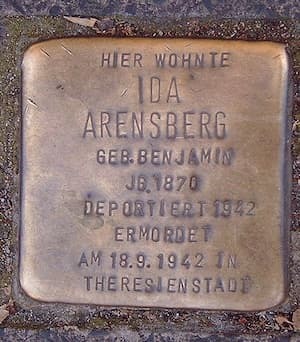 “[The plaque is] an exception: we usually want to mark the places where the Nazi crimes and persecution began, but we think it's also very important to focus on the places where the people who had to leave their countries were located," Anna Warda, a leading member of the Stolpersteine project, said in an interview with the Spanish news agency EFE, in 2017. These are not meant to be examples of one block, one person, and one name. Admittedly, they memorialize a group. In the New Yorker magazine, Elizabeth Kolbert recalls her encounter with Demnig when she recently went to the installation of a block memorialising her great grandmother: “Demnig has wild gray hair and sad eyes, and he reminded me a bit of Bert Lahr [who played the cowardly lion] in The Wizard of Oz. He was wearing a felt hat, clogs, and khakis, and had a pad strapped on one knee”. One can find films on the Internet about the project that portray Demnig installing the blocks and people praying for the victims and giving speeches about the circumstances concerning their persecution. Sometimes there are a few people present for the laying of the blocks; sometimes there are many; some of those attending may have travelled thousands of miles to witness the installation. It is their ancestor who is being named in brass. The installation may be in a quiet side street, or a busy thoroughfare. Deming brings his own tools and concrete for the installation. He works patiently and carefully; one could suggest with gentleness. The Stolpersteine can be a cause for controversy. Some of these modest stones have been vandalised since the programme began. 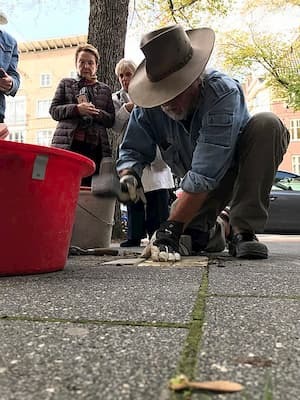 One man was caught on camera uprooting a Stolperstein in the town of Boppard, Germany nearly eighteen months ago, although he was not prosecuted. Others have tried to prevent installations in front of their homes, but as, legally, pavements are considered public space, if the council has granted permission for installation, the opponents’ efforts are thwarted. Some people find the fact that they are underfoot – in the dirt, so to speak - disrespectful, insulting. For detailed information about the Stolpersteine project, including how to apply for an installation, please visit here. Top image: A Stolpersteine. Image courtesy of Hans Weingartz. Bottom image: Gunter Demnig installing a Stolperstein. Supporting children through relocation, Assistant Dean of Overseas Admissions at ACS International Schools, Anastasia Cotton, shares her favourite storybook titles on transition and change. Travelling half-way around the world for international relocation is a huge change for even the most well-adjusted adult to manage – so how can we support children experiencing the move, whilst juggling the tricky business of growing up? As with so many transitional stages of childhood and adolescence, support and discussion initiated with a story – or picture book for younger children – can be a gentle way to approach any worries. “It’s easier for children to process things they hear ‘third-hand’ during reading-time cuddles,” explained clinical psychologist Wayne Fleisig to The Washington Post. For children who might be experiencing a range of feelings – loss, sadness, uncertainty, anxiety, anger, and even excitement – it can be helpful to select a number of titles to choose from in both the run up to moving day, and in the first months of re-settlement. Parents might find that children identify with a particular character or series of books, and revisiting these stories can provide an additional comfort in unfamiliar surroundings, as well as acting as useful tools for conversation. For little ones who are unsure how to articulate their emotional reactions, it can help give them the words and phrases they need to ask for support in a meaningful way. Supporting activities such as scrapbooking, story-writing, journaling and writing to pen-pals can also be both calming and encouraging for a lot of children. In one of my recommended titles, B at Home, the main character is given a booklet to document her adventure, and it becomes an important keepsake of a life-changing move. Very often, one of the most daunting elements of moving countries is the prospect of facing a new school and all the associated challenges, from adapting to new teaching styles to making friends during recess or in class. “Relocated adolescents often face a double stress of adapting to an alien environment, a new school, and building new friendships and social networks, while simultaneously coping with the fundamental biological and developmental transitions that their peers also experience,” says British researcher, Roger Webb, for the American Journal of Preventative Medicine. 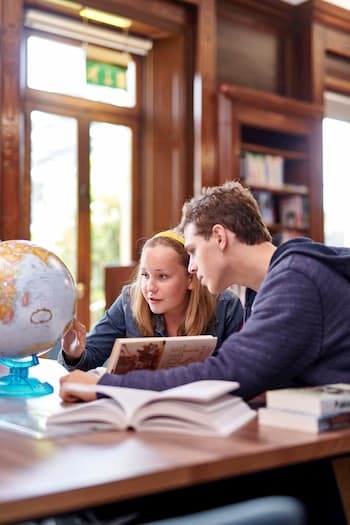 Here at ACS, our school environment is built around helping students manage these transitional stages, easing children and teens gently – and quickly – into life in the UK. Our new families have a readymade community on hand to share their experiences, knowledge and to help them settle into their new homes. Each school has a fully trained pastoral care team and counsellors alongside programmes including the Welcome Team; a group of parents and staff on hand to help families adjust. The extended community here welcomes new families and fosters long-lasting and supportive friendships not only within school, but via weekend BBQs and breakfasts, matching relocated families for email exchange, international fairs, student-buddy programmes, our popular annual High Tea and, of course, regular book clubs. Alongside all these wonderful methods of support offered by schools, friends and family, it is our experience that starting with a story is a great first step in helping children adjust during times of transition. Stories have the power to help readers handle not only their own feelings but other people’s too, which goes full circle in our ACS family as children experienced in relocation help their new peers navigate the change happily and successfully. Every year, around this time as the days get longer and the temperature gets warmer, we say goodbye to the winter and welcome the spring. Growing up in Montreal, this time of year would typically mean a family trip down to Florida to watch some spring training Grapefruit League baseball games followed swiftly by Opening Day back in Montreal at the Olympic Stadium. The Montreal Expos never won the National League Pennant and never made it to the World Series, but spring for me was always about ‘rooting for the home team’ in the hope that this would be their year. After the Expos moved to Washington, I moved to New York City and then to London in 2001. My three children were all born in London and attended British schools when they were younger and so grew up playing British sports. One weekend in April, about 10 years ago, there was a gap in-between British sports seasons - where rugby ends and cricket begins. One of our American friend’s invited us to join him and his family at Wormwood Scrubs where his children were playing baseball. Our whole family came down and our oldest who was about 6 years old at the time, borrowed a glove and played baseball for the first time. Like any new sport, he didn’t know the rules or have the technique, but most of the other kids didn’t either. At that age, competition wasn’t priority - they were all having so much fun. He jumped right in, and with the help of the father/coaches who did a great job including him, they helped all the players learn and hone new skills allowing them all to enjoy the day. To my surprise he asked to go back the following week, and we did. Two weeks turned into three, which quickly turned into four, and after eight weeks the summer had rolled around and the season was over. Ten years later my oldest son heads off to ‘the Scrubs’ every Saturday and Sunday, sets up 12 fields and backstops of various sizes, umpires games and takes down the playing fields with friends he has made through baseball at the Scrubs. My two younger ones are going on their 6th and 8th seasons. My wife and I enjoy the chilli and BBQ food from the stalls, help during the pre-game practice, watch the kids play and cheer them on from the sidelines in our folding chairs which we take out to the Scrubs every weekend. There is something magical about a weekend at the Scrubs. Throughout the years, we have met amazing friends who come from all walks of life. We communally commiserate about the specific micro-climate at the Scrubs where we can sometimes suffer/enjoy all seasons - winter, spring, summer and fall - all during the course of a few hours! We enjoy a break from London as we watch our kids enjoy partaking in America’s favourite pastime, whilst they get a break from their iPhones and PlayStations. As a family, we get the chance to come together. I really enjoy having everyone in one place for a few hours a week instead of the usual reality of various activities forcing us all in separate directions. 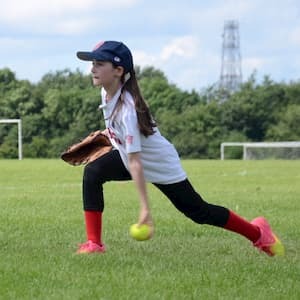 LondonSports is the biggest youth baseball league for boys and softball league for girls in the UK (ages 5-18) and has been going strong for over 32 years. It’s a developmental league that was originally built on the principle of putting busy parents and kids together on a field playing a game many of us grew up with. Since the 1980’s, many generations have made the pilgrimage to the Scrubs and built the programme a year at a time. The ‘pop-up’ nature of the fields is one of the defining characteristics of the programme with fields set up and torn down every day we play. As is the umpire programme that encourages older kids to stay with the league, take on some responsibility and earn some money along the way. A few years ago, we incorporated the programme as a UK charity to better plan for future growth and allow us to raise funds in both the public and private sectors. At the end of the day, it is a family-friendly, all-volunteer labour of love. 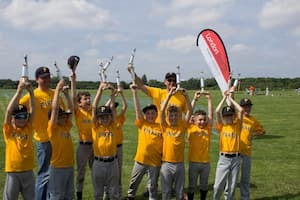 So if you grew up playing or watching baseball and wanted your children to have a little taste of what that was like, then the league at the Scrubs may be just what you and your family are looking for. Spring training will begins late in March, but the league really gets going after the Easter break and we are looking forward to another great year. If you are curious but not sure, don’t have a glove or just want to see it in person, come down with your kids and play for an hour or two and meet the volunteers who run London Sports. Have your child try it out and see if he or she gets hooked just like my children did years ago. Submitted by Josh Matthews, Managing Partner of Maseco Private Wealth. For further information please contact: info@londonsports.com or visit www.londonsports.com. It can’t be easy to write a joyous and uplifting yet thought provoking play about 9/11, and yet Irene Sankoff and David Hein have done just that. This award- winning Canadian musical has already enjoyed hugely successful runs in Toronto, California and Seattle and on Broadway as well as six other productions around the world. It has hit the ground running in London with an audience reaction that can only be described as ecstatic. Based on a true story, Come from Away is about five days in 2001 when 38 planes were diverted to Newfoundland following the World Trade Centre bombing. Passengers were kept on the planes for over twenty-four hours, not told the truth of why they had landed. In the meantime, the 10,000 residents of Gander prepared to welcome these strangers into their homes, community centres, schools and anywhere they could fit them. Many passengers could not speak English, had different dietary requirements and health needs. Most were worried about friends who may have been flying that day or were desperate to let their families know they were okay. The residents wouldn’t accept any payment but just kept donating whatever was needed in terms of groceries, help or simply friendship. In 2011, Sankoff and Hein spent a month in Gander collecting stories of residents, flight crew and passengers, many of whom had gathered there to commemorate the tenth anniversary of 9/11. Although some characters are combinations of various people, many are based on the actual person with their real names used. Amongst the passengers, we hear the stories of gay couple Kevin and Kevin who were worried what locals would think of them (they were unfazed, everyone knew someone gay), British oil executive Nick who falls in love with American Diane, New Yorker Hannah who is waiting for news of her firefighter son, and Ali, the world-famous hotel chef who just wants to help out in the kitchen. The locals have their own fascinating stories: Bonnie who works in the animal shelter is concerned for the cats, dogs and two rare chimpanzees stuck in the holds. Beulah befriends Hannah as she also has a firefighting son. Claude, the mayor of Gander, is in charge of finding accommodation for the Come from Aways, as outsiders are known. The crew are represented by pilot Beverly who fears for her fellow pilots. Her story of her career as a female pilot raised a cheer from the audience on the night I saw the show. All is not smooth sailing for the Muslim guests however, who are treated with suspicion despite being just as baffled and afraid as all the other passengers. Ali is subjected to a full body search when they re-board the planes. It is admirable that the writers do not shy away from the less than welcoming behaviour of some officials and residents. African American Bob, however, who has his own initial suspicion of the friendly residents, is amazed that he isn’t shot when he is told to go collect everyone’s barbecue grills from their front yards. He bonds with another local mayor who invites him to stay in his house and ends up sharing all of his whiskey. There is a nice variety of stories told, although it would have been good to hear more from passengers from other countries. In any case, it is a story that warms the heart as this disparate group of people pulls together in a moment of crisis and ends up forming lasting friendships. 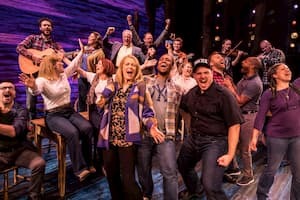 The creation of the musical has in turn brought everyone together repeatedly as they have seen themselves portrayed on stage in the many incarnations of Come from Away. The cast work as a true ensemble, having to change character, costume and accent frequently, from American to Newfoundland (which sounds a bit Irish), to British or Egyptian. Jonathan Andrew Hume was especially adept at transforming from one of the Kevins to Ali by just adding a hat and brought real depth to these two characters. Robert Hands as Nick, and Helen Hobson as Diane, beautifully played out a burgeoning love story between two middle aged people who were surprised to find their soul mate in such tragic circumstances. Hands also doubled as air traffic controller Doug whose wife Bonnie, the fine Mary Doherty, risks a bomb threat to rescue animals from the parked planes. Rachel Tucker as Beverly, Jenna Boyd as Beulah and Cat Simmons as Hannah all gave strong performances as strong women who have to deal with impossible situations. The songs all have an authentic Newfoundland sound, with a flavour of Irish and Scottish folk music. The music is multi-layered and rich and the songs soar with emotion. The excellent onstage band included a fiddle, an accordion, whistles and an unusual hand drum, which the percussionist played with glee. Director Christopher Ashley and choreographer Kelly Devine also deserve mention for the smooth staging and clear delineation of all the many characters portrayed by this talented cast. This is definitely a musical for the whole family, despite the difficult subject matter of 9/11. It is heart-warming, funny, sad and inspiring all at once. Come from Away will surely encourage mass tourism if not mass migration to Newfoundland. Image: Come From Away at the Phoenix Theatre. Photo credit Matthew Murphy. After many UK revivals of Arthur Miller’s most popular plays, such All My Sons, A View from the Bridge and The Crucible, is it refreshing to see a lesser known work, The Price, from 1968, brought to explosive life in Jonathan Church’s excellent production. Inspired by events from his own life, this family drama looks at the price one pays in life for the decisions that one makes. Middle-aged policeman Vic has come to his father’s old New York brownstone before it is torn down to meet a used furniture dealer, hoping to sell everything off as one lot. His father died sixteen years ago and the place is full of memories: a fencing blade that Vic used to compete with, his mother’s old harp, a bizarre record of laughing, as well as old furniture literally piled up the wall. Vic’s glamorous and slightly drunk wife Esther joins him, demanding that he take whatever he can get and not share the proceeds with his wealthy surgeon brother, Walter. Esther, who is clearly unhappy in their marriage and doesn’t know what to do with her life, insists that Vic needs to sort out his own plans after retirement. Both appear to be stuck, disappointed with the paths their lives have taken; as Esther says “It’s like pushing against a door for twenty-five years and then it opens and we stand there, waiting to live.” Vic dropped out of studying science at university to look after his father who lost everything in the crash of 1929 while his brother Walter went to medical school. Esther used to write poetry and misses their son who is studying at MIT. She feels cheated but doesn’t seem to know what she wants other than money. When Gregory Solomon finally arrives to make an assessment, neither quite know what to make of the charming eighty-nine-year-old who claims to have once been an acrobat and had three, possibly four wives. Vic is inclined to trust his prognosis that the furniture is bulky and out of fashion and therefore worth far less. As Solomon says, it’s so well made, it cannot break, “today everything has to be disposable”. Esther is sceptical and thinks he’s cheating them so that he can sell it on for far more. Just as Vic makes a deal with Solomon, who counts out hundred dollar bills, in walks Walter. Despite not having seen Vic since their father died nor even returned his phone calls about the possible sale, he has turned up with his own proposition. Walter treats Solomon like a figure of fun and the power dynamic switches as he and Esther openly laugh at him, completely dismissing any deal Vic may have already made. The layers are soon peeled back on Walter’s seemingly perfect life and old resentments rise to the surface as the two brothers and Esther try to examine the past and decide on their futures. This is a well-crafted play with complex characters and dialogue that rings true. The arguments between the brothers seem to go in circles in the second half – just when you think they’ve had a reconciliation, more past hurts and misunderstandings are dragged up. However, this is probably a reality in most sibling relationships so perhaps one can’t fault the playwright for not trimming the dialogue. Brendan Coyle, familiar to many as Mr Bates in Downton Abbey, brings the right gruffness and bottled up emotion to Vic, a strong man who has had to carry others for so many years and is now at a breaking point. He beautifully conveys a character who is thoughtful yet not used to introspection, always doing what he thinks is morally right. Adrian Lukis (Mr Wickham from the 1995 BBC adaptation of Pride and Prejudice) hits just the right notes of a man who thought he had it all and now feels empty and confused. He veers from being impossibly full of himself to completely drained of any energy or direction. Sara Stewart as the passionate and impulsive Esther impresses from her first entrance as she shows off a new expensive suit she has just bought, looking like Marilyn Monroe. Although slightly one note in her despondency, she manages to maintain some sense of humour amidst her disappointment. One gets the feeling that all three of these characters are self-destructive while blaming their misfortunes on each other. David Suchet gives the performance of a lifetime as Gregory Solomon, at once wily, warm hearted, highly intelligent and very funny. When he suddenly pulls a hard- boiled egg out of his pocket in the middle of negotiations and proceeds to calmly eat it, asking if there might be some salt somewhere, it is a priceless moment. Although he is in a back room for most of the second half, he still makes appearances, interceding in the middle of heated family battles to give advice. It is no surprise that a well written family drama like The Price survives the test of time and still resonates today. Miller is a master playwright who was never afraid to ask the big questions about the paths we choose to follow in life and the responsibilities we choose to take. Don’t miss this brilliant production. 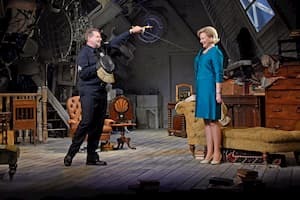 Image: Brendan Coyle and Sara Stewart in The Price. Photo credit Nobby Clark.